I've read that solid state hard drives (SSDs) are much faster, especially when starting up the computer. But other articles claim they are less reliable than traditional magnetic hard drives. Should I consider upgrading my system with an SSD? I'd appreciate your perspective, thanks. Solid State Drives: Should You Upgrade? Solid-state drives (SSDs) are the greatest thing in mass storage, we're told. Laptop users find the faster boot time and shock-resistance of SSDs especially appealing. (See my related article Solid State Hard Drives to learn more about SSD technology.) But before you upgrade your traditional hard drive to a SSD, there are some points you may want to consider. You didn't say whether you have a laptop or a desktop PC, so I'll try to cover both scenarios. On the downside, SSDs are still very expensive, on a per-gigabyte basis, compared to traditional hard drives. A modest 240 GB SSD costs about $300 right now. But a traditional 500 GB drive sells for around $40. That makes solid state drives about 15 times more expensive. Available SSD capacities are relatively small, probably because larger ones would cost too much. A 1 Terabyte SSD (1000 GB) currently costs over $3,000. If you run Windows XP, you won't get the best performance from a SSD. Vista and Windows 7 include a feature that helps you get the best from SSDs. So consider upgrading your operating system before buying an SSD. The drive interface that your computer supports is also a factor. If you have an old computer with IDE or parallel ATA interface, it is not worthwhile to upgrade to SSD. The slow interface means you will not realize enough of the SSD's speed advantage to justify the investment. Make sure your computer supports a SATA drive connection before considering the purchase of an SSD. The size of the drive matters, too. Desktop PCs typically have 3.5 inch drive bays, while laptops need 2.5 inch drives. Netbooks may use 2.5 or 1.8 inch drives. Adapters are available for loading a 2.5 inch drive into a 3.5 inch bay, but otherwise you need to match your SSD's size to the bay exactly. It's true that a system with an SSD will boot up a lot faster. But you may be surprised to learn that SSDs are not faster than traditional hard drives in all applications. SSDs excel at short, random write operations, but long writes of large data files can be slower than even a 5400 rpm hard drive. Thus, an SSD is not the best choice if your work involves large files, such as video recording and editing. Battery life is a significant advantage for SSDs on laptops. Because they have no moving parts, SSDs use far less power than traditional hard drives. You could get an extra couple of hours from a battery charge. How long an SSD will last is still a matter of controversy. Nearly all consumer-class SSDs use MLC (multi-level cell) technology that stores more than one bit on each memory cell. That makes MLC SSDs much cheaper than the enterprise-class SLC (single-level cell) SSDS. But MLC can take far fewer write cycles than SLC before wearing out. A newer technology called eMLC makes MLC SSDs last three times longer. SSDs make the most sense for laptop owners. The ruggedness and battery efficiency of SSDs are ideal for mobile computing. All computers will boot and shut down faster with SSD. For rapid writing of small data blocks, SSD cannot be beaten. But for working with large files, the performance of SSDs may not be worth the cost. For desktops, the relatively new hybrid hard drives are appealing to me. These drives combine traditional magnetic spinning platter technology with solid state storage. See my related article Hybrid Hard Drives to learn more about this alternative. 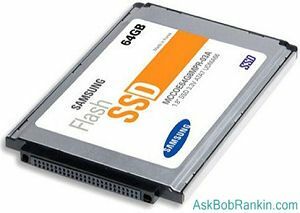 Bottom line, I think SSDs are great for laptops, as long as you can justify the higher cost and reduced storage capacity. But for desktops, where storage appetites are generally larger, I'd say it's better to wait, because of two factors. The technology and reliability will certainly improve over time, and the cost will go down as manufacturing volumes increase. How Fast Is Your PC? Most recent comments on "Upgrade Your Hard Drive To SSD?" Great post, Bob! This will be in the top ten for sure. I'm going to put a link to this on our blog. One point I would add is that few data recovery companies know how to recover SSDs so having a good backup solution is a must. I have several solid state drives, and I find them great for backups. But I find I have to use them with caution, because my very first 64gb drive went south a couple of years ago, about 6 months after I had purchased it. The newer ones--I have a 64, a 32, an 8, and several 4s--seem to be OK. I'm still waiting for them to get bigger better and most of all cheaper. It's taking a lot longer than I thought it would. I'm also interested in the hybrid drives too. I think they also need to improve as well. I think they need more ssd space, and the software to utilize them is not quite there yet either. I'm guessing 3 to 5 more years and they should both be ready for prime time. Anything that won't work well/properly with XP is worthless. Thanks for educating me. Bob in this report you stated that a current 500 GB hard drive was running about $40 or so. Where can I get prices like that? My hard drive just went South (a Western IDE 160GB) and the best I could replace it at was Newegg for just under $45. I'm expanding my system to accommodate Win7 and would have gladly got a larger hd if I could have found prices like you said. Great post! I replaced two laptop hard drives with Crucial SSD's. I based my purchase on my needs rather than wants. I don't need a large hard drive in either laptop. I do, however, demand reliability and durability because both machines travel with me. One of them runs Ubuntu 11.04 and the other one is Windows 7 Professional. Both OS's support TRIM using the default file systems. One machine has a 64GB and the other is a 128GB. I would NOT ever purchase a drive soley based on it's speed. This is not a place to attempt to safe money without exercising a ton of caution. Intel, Samsung and Crucial all make great drives. You can get great SSD performance with Win XP - just go to Intel's site and download their SSD Toolbox software and run it. Even better switch to Linux Mint - it's much faster than Win 7 and recent versions support the TRIM command - it has to be enabled manually but is quite easy by going to the /etc/fstab/ file with the command gksudo gedit /etc/fstab/, type your password and enter, then type the word 'discard' in the ext 4 file attributes list, hitting save, and then restarting. TRIM is then permenantly enabled. I have used Linux Mint 11 with the Intel 510 SSD for 8 months now with excellent performance and no decrease in speed. Linux and SSD's are made for each other since you don't have to defragment in Linux. I realize SSD requires less power and consumption, however can anybody give me a technical response to go down to a 90watt. I've noticed some replacement aftermarket for 90w, although OEM is at the 120w rating. I recently had my original go out on me and used my HP printer's of 65w and it actually worked and will be using it as an emergency so I don't see why I couldn't buy the 90w as a permanent replacement. Additionally it will save nominal energy for vehicle/mobile use. Instead of an yes or no, a technical answer would be appreciated. Thanks in advance. EDITOR'S NOTE: That's outside my area of expertise, but personally, I would hesitate to use a power adapter that didn't meet the OEM specs for the machine. Why do you want to go to 90W, if the savings are nominal?